Conis's father and a brilliant inventor from Skypiea who fixes the waver Nami rides. He has a habit of apologizing for everything; even things that he isn't even responsible for, or things that warrant no apology whatsoever (introducing himself, accepting a drink, etc.). 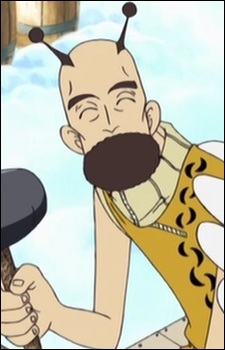 Pagaya was thought dead as Enel attacked him while he was helping an injured member of the Royal Guard, who had just revealed Enel's plans to destroy Skypeia. But he resurfaces later, alive and well. He helps the Straw Hat Pirates despite the fact that they were labeled as criminals for not paying their toll fee.